After a weekend full of delightful Disney-based news, we've compiled some of the most exciting things to come from Anaheim's D23 Expo. This weekend saw the Anaheim Convention centre flooded with hundreds of Mickey and Minnie’s as Disney hosted their semi-annual D23 Expo. The event is a chance for the Walt Disney company and Pixar to showcase never-before-seen footage from it’s upcoming films. As well as this, there were also several exciting production and casting announcements. This year, D23 bought in a whole roster of A-list celebrities to present the various panels, such as Dwayne Johnson, Ellen DeGeneres, Johnny Depp, Lupita N’yongo, Harrison Ford and many more from the collective universes of Disney, Pixar, Marvel and Star Wars. On Friday night (14th August), Ellen was on hand – alongside director, Andrew Stanton – to announce new details about the upcoming Finding Nemo sequel. The story will focus on the exploits of the confused little blue tang, as she tries to remember where her home and family is. As Dory tries to make her way home, she somehow manages to end up in an ocean sanctuary facility where wounded animals are treated and then re-released into the wild. There, she meets Hank the Octopus (Ed O’Neill) – who is actually a ‘septapus’ because he’s missing a leg – and a white beluga whale (Modern Family’s Ty Burrell), who mistakes his head hump for an injury. Also featuring the voices of Albert Brooks, Diane Keaton and Eugene Levy, Finding Dory is set to swim into UK cinemas on 29th July, 2016. Friday night also saw the announcement of the ‘definitive’ version of the Jack and the Beanstalk tale, with songs to be written by Oscar-winning Frozen songwriters; Kristen Anderson-Lopez and Robert Lopez. The film will apparently be set in Spain during the 15th century, wherein Jack will discover not just “one big castle and one big giant walking around” but “a whole new world up in the sky,”according to director Nathan Greno, (who also directed the hit 2010 fairytale, Tangled). The first giant Jack meets up in the sky will be a gigantic 11 year old girl named Ima, who is 60 feet tall. Greno stated that the feisty character was inspired by an actual young girl they met while location scouting in Spain. Gigantic is currently slated for a 2018 release. The Columbian pop star will lend her voice to a character named Gazelle, who lives in the anthropomorphic animal city, which includes regions such as Tundratown and Bunny Burrows. The ‘Hips Don’t Lie’ singer is also set to contribute an upbeat original song – ‘Try Everything’ – for the upcoming Disney film. Zootopia centres on optimistic police bunny, Judy Hoops (Ginnifer Goodwin) who comes up against a con artist fox called Nick Wilde (Jason Bateman). In a twist of fate, the unlikely duo are forced to team up to face an as yet unknown foe. Zootopia is set to be released on 25th March 2016. Orlando Bloom is set to reprise his role as Will Turner in the latest Pirates Of The Caribbean film. Alongside Johnny Depp and Geoffrey Rush (Captain Barbossa), Bloom will make an appearance in the franchise’s fifth instalment, Dead Men Tell No Tales. Bloom was one of the main stars in the original trilogy, alongside Keira Knightley who played his love interest, Elizabeth Swann. Also starring Kaya Scodelario and Javier Bardem, Dead Men Tell No Tales is set to be released on 7th July 2017. Concept art for the new theme park. As well as unveiling new details about their anthology film, Rogue One, and the next film in the chronological Star Wars series (which is set to be directed by Jurassic World‘s Colin Trevorrow), Lucasfilm have also announced plans to build a new Star Wars theme park. Headed to Disneyland in Anaheim, California and Disney’s Hollywood Studios at Walt Disney World Resort in Orlando, Florida, this will be Disney’s largest single themed-land expansion ever. Both areas will feature fully immersive attractions that transport guests to never-before-seen planets, remote trading ports, and wild spaces wherein Star Wars characters come to life. Each land will also feature two signature attractions: a thrilling battle experience between The First Order and the Resistance, and an attraction that allows guests to pilot the Millennium Falcon. Two posters for the sequel to Tim Burton’s 2010 live-action fantasy, Alice in Wonderland, have been revealed. Featuring distant images of Johnny Depp’s Mad Hatter and Mia Wasikowska’s titular Alice, the images act as the first real teaser for the long-awaited film. 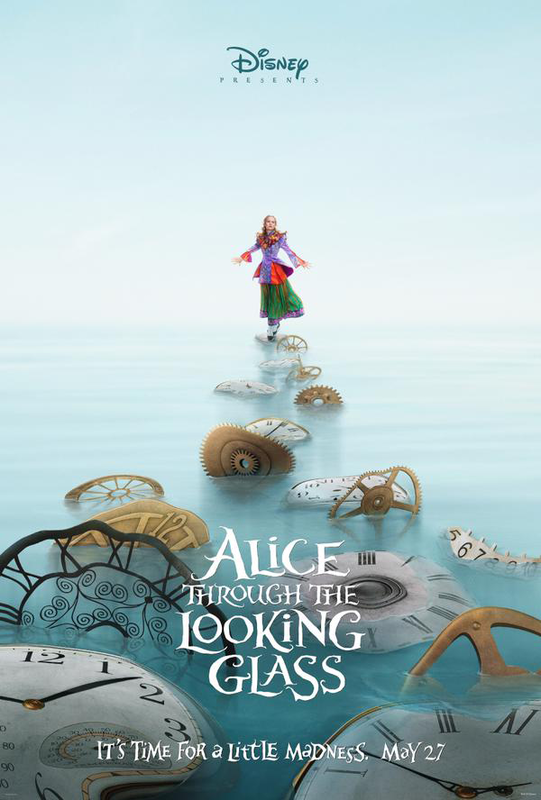 Directed by James Bobin (The Muppets), Alice Through The Looking Glass is set to hit UK cinemas on 27th May 2016. The Disney Legends Awards is a Hall of Fame program that recognises individuals who have made an outstanding contribution to the Walt Disney Company. Established in 1987, the honour was traditionally awarded during a special private ceremony, but since 2009 it has been awarded biannually, during Disney’s D23 Expo. This year saw the induction of Johnny Depp and George Lucas for contribution to film and parks and resorts, while Danny Elfman was also awarded for his contribution to music.